Helpful Toddler Tips And Advice For Parenting Your Child At Or Away From Home. Who doesn’t appreciate toddler tips and advice? I have only one son and I welcomed advice from anyone. My family, other mothers and more importantly, the internet offered me great information. I survived the“newborn” years by tons of awesome tips from others. From potty training to saving money by removing stains from their clothing. This is the reason I created this website, my motto is "All advice welcome"! I realized to have “FUN” and not get stressed out. The toddler stage is my favorite developmental stage in a child’s life. My son is now 6 years old and I loved every phase of these years. I learned to relax and enjoy this “little person” who is discovering and learning who they are. This page will be a great stepping stone to help you get through the rough stuff. What I mean by rough? Well let’s talk about those terrible twos or how about potty training. We will even find time to address toddler routines. Believe it or not I have tips that make these phases seem effortless. We will even discuss toddler adoption and the difference it can make to a child. Can you believe it? All this and so much more. Look moms I am not trying to scare you, I will be here to help when you feel like pulling your hair out. That is what is so great about Toddlers Are Fun.com. 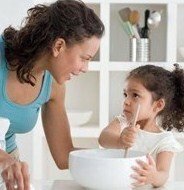 It is my passion to pass on all of my great toddler tips that help me out tremendously. In this life we need to support one another. Remember the old saying “It takes a village to raise a child.” I believe there is so much truth in that statement. That is what we are doing by sharing our advice and toddler tips. We help each other approach situations or problems in different ways to raise our children better. That is what is great!! I know that you would do the best for your toddler. That is why we look to others for different advice. We all can use help to improve our parenting skills. You have to be open minded to try new things because you truly never what will work unless you try it. It is amazing how the easiest solutions are right there under your nose and you just didn’t know it. Moms and dads embrace this stage in their lives. Enjoy your toddler and have “FUN". When the parents are happy your child will be happy. I hope these tips will help in your journey, this journey of parenthood and most of all love. I also welcome advice and opinions from all of you. Please feel free to contact me and share some of your own personal toddler tips and advice. You can never have too much information in this life. Potty Training Tips For Your Toddler. Helpful Potty Training tips and advice that work. Help your Toddler make this huge step. Learn Parenting Skills That Will Last A Lifetime. Parenting Skills are important to learn. Read how you can become a better parent to your children through my tips.